Scar. Illness. Arrival of Winter. Things are piecing together slowly. The pieces to Reki’s past have mostly come together, although there’s still mystery behind Hyohko’s part in Reki’s running away. The amount of closeness one can feel to the characters after six and seven episodes amazes me. The total time of these episodes together may be more than two hours, more than the length of a movie, but it’s still amazing to see. Reki’s position as a Sin-Bound adds a good twist to the story. Nemu knows about Reki’s wings, but Hikari and Kana probably do not. Hyohko doesn’t know it, or he’d know she’s Sin-Bound, and wouldn’t have asked Rakka if she left.. Rakka may have been the only one to see Reki’s painting, the only one to hear about her dreams. Going from Rakka’s depression over losing Kuu, through her attempts to stop the spreading blackening of her wings, came as very well paced. 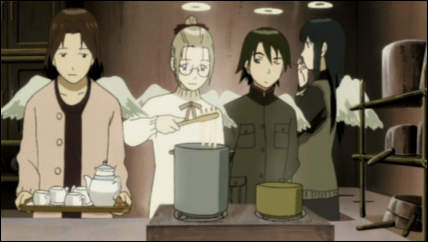 Rakka’s facing many kinds of adversity after having finally settled in to her life as a haibane. Even if she’s able to come to terms with Kuu’s day of flight, what happens when another has to leave? Will Rakka be prepared for it? Still, and and Kuu were closer than Rakka with any of the others and probably than Kuu with any of the others, as evidenced by Kuu placing the “Kuu” frog and the “Rakka” frog beside one another. It’s understandable for Rakka to talk to Kuu as she cleans Kuu’s room, but then you realize it’s been a month since the day of flight, it all sinks in. The impact is realized. Rakka’s been hit and she’s been hit hard. Adding the disease to her wings only makes matters worse. Not only does she have to keep her head held high each day without Kuu around, but she has to worry about the well-being of her wings, both because of the blackening and because of the damage she’s caused them by clipping them. There has to be more to Reki’s past waiting to be shown. It’s now clear the terms of the big fight Reki and Nemu had, although Nemu didn’t give the impression of knowing the reason when she told Rakka about when they lived together. One thing for certain, when Reki said everyone around her leaves, it’s because she believes she cannot leave. 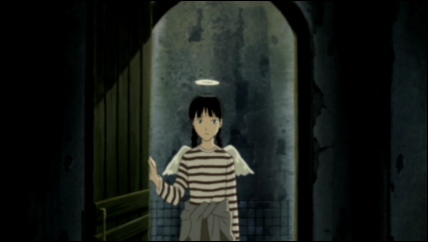 Haibane will come and go, and she will always remain in Old Home. What I’ll be waiting to see is if Hyohko tries to make amends for upsetting Rakka. He didn’t mean anything by what he said, but he knows about a haibane’s day of flight. 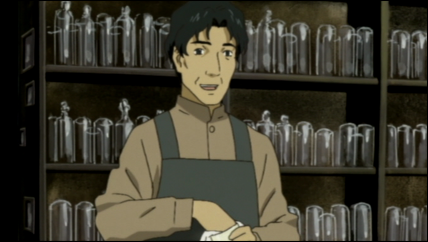 Even the café owner who thought Kuu was a boy knew. Speaking of the café owner, how did he gather than Kuu was a girl by her name? I believe he said he always had trouble remembering her name, which would suggest he’d heard it before. I can understand Hikari being a feminine name, but names such as Kuu and Reki I could see going either way. The age thing finally has become clear to me. I mistook Kana’s comment about when Kuu first arrived as to be when she hatched from the cocoon. But, if it had been about four years since the last cocoon appeared, and if that was Kuu’s, then that didn’t match up with Kuu’s current age and her appearance in the flashbacks. If, on the other hand, Kuu started out as a Young Feather, she could have graduated to being with the Older Feathers not long before Rakka arrived. This matches up with Kuu telling Rakka that if Rakka were any younger than Kuu, she’d be placed in with the Young Feathers. It looks as if Rakka’s down to her last notebook page. Considering her depression, she probably never took a job. This will have to happen in the next couple of episodes. As the council said, the notebook guarantees Rakka’s daily life, but it will only do so if she works. Otherwise, she’s taking without giving, and soon will be unable to take anything else. 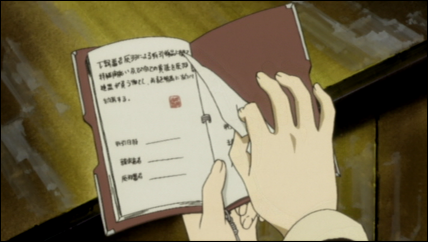 As a final thought, maybe the day of flight is why haibane only buy used items. It would be a shame to leave behind fairly new items when leaving the walls. 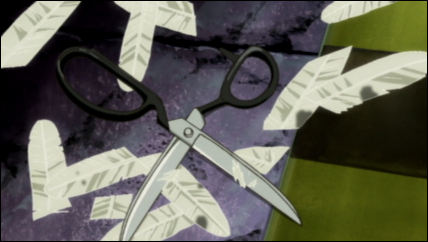 But, what becomes of a haibane’s items after she leaves? Will Kuu’s items be redistributed among the others in Old Home? I think the owner of the cafe did not know about the day of flight and its significance. 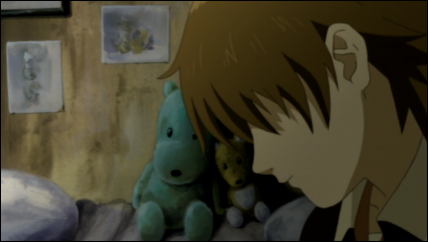 He only knows that haibane that he employed over the years disappear suddenly. That could be. Without knowing the human-to-haibane population ratio, it’s very possible that some humans in the town go their whole life without seeing a haibane, or more likely that it’s rare (but not unexpected) to see one. Considering this, it becomes expected for humans to know little about them, beyond any dealings with the renmei on matters of employment. By the way, Japanese books begin from the other end, which may have implications for your deduction about Rakka’s notebook. Ha, I didn’t even think about that. When watching episodes in English first, and when there’s really no sign of “Japanese” culture (that does look like Japanese on the paper in the booklet), it’s easy to miss something like that. Considering pages get torn out, I’m left thinking, “Oh yeah, duh.” Thanks for pointing that out, as it really does change the whole view of things there! I don’t think Kuu could have started out as a Young Feather- or else she would have been named for a future dream of floating in the air, rather than the one she described from the cocoon. It did seem that Kuu had a dream of flying someday, but I think she was named for her experiences in the cocoon. That’s a good point about her name; I haven’t considered it. So, if Kuu is just above the cut-off point of not being a Young Feather, then how does that play with how long it was since the last cocoon appeared, before Rakka’s? Yeah, this series confuses me here and there, probably a product of my own over-thinking things.